Web Projects - Click for web study materials. How do you create an interactive web page using HTML & CSS? Learn coding basics of using HTML & CSS to create interactive web sites that will utilize all areas of Digital Media. In order to understand web design it is important to understand some basic coding languages. Follow the tutorials from the code academy to understand basics in HTML and CSS. How do you create a responsive web site using bootstrap? You have been hired as web designer by Entertainers Design Company. They want you to create a basic website for an entertainment industry - Sports Program (NFL, NHL, NBA, MLB, NCAA, etc), Music Company (Bad Boy, Def Jam, Atlantic Records, etc), or Film Company (Disney, Pixar, Paramount, Marvel, MGM, etc). You are to follow the directions given by the project manager for the target audience to complete the project. Once complete then you should review the checklist for grading criteria before turning in your work. Complete and submit the online rubric for this project once it has been completed. Remember you must save all files in your folder and do not move them from this folder. Use the slide show below and follow to create this site. How do you use a template to customize and alter HTML and CSS Code? Create a 3 page blob on your spring break or a recent vacation. You have been hired by Vacations Destinations. They want you to create a blog documenting a vacation destination. You are to follow the directions given by the project manager for the target audience to complete the project. Once complete then you should review the checklist for grading criteria before turning in your work. Complete and submit the online rubric for this project once it has been completed. We will be creating a 3 page blog. The blog will be structured around your spring break or around a recent vacation. Make a Root folder in your Web folder (call it BLOG). Make a new site in Dreamweaver, then make a new Dreamweaver Document. Select the Starter Templates > Responsive Starters > Responsive - Blog Posts. Save this template page as index.html. In the nav - change the links at the top right to Day1, Day 2, Day 3, and change the logo text on the left to SPRING BREAK (or whatever vacation destination you are covering). Alter the appearance of the Sidebar by deleting the extra links in the html code, and adding 2 extra image boxes to the sidebar by copying and pasting the code. Remove the Footer 1 and Footer 2 paragraph sections at the bottom. Use the CSS to alter the colors on the page. Link the navigation up top by typing in the Properties Link for each day. (day1.html, day2.html, day3.html). In the files window duplicate 3 times. Now all pages are set! Select the images you will use (4 per page), resize all images in Photoshop and save in the images folder. 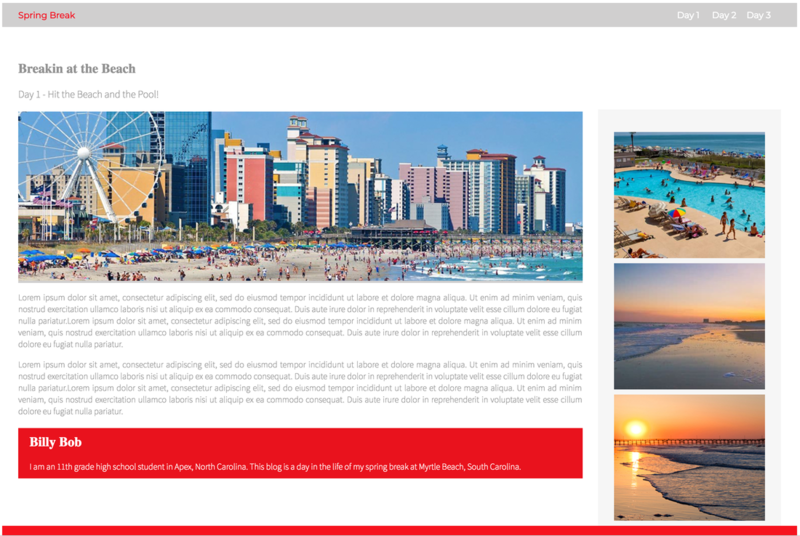 Replace placeholder images on each page relating to each day, replace all the lorem ipsem text to information about each day of your spring break or vacation for each day. 9 - Web file is saved as a HTML file and saved in the root folder (BLOG). The root folder is saved in the Web folder in your portfolio. 10 - Final web files are submitted with the instructed names for the project. How do you create professional web app using HTML Code? Create a professional web app for a recording artist. You have been hired by Mobile One. They want you to create an mobile web app for a band, sports team, an individual athlete, or an actor. You are to follow the directions given by the project manager for the target audience to complete the project. Once complete then you should review the checklist for grading criteria before turning in your work. Complete and submit the online rubric for this project once it has been completed. We will be creating a Web App for mobile devices. We will be using an open source web standard called, WebKit. The tutorial is set up for creating for a musical artist. Since ours is different you will adjust the pages as follows: You will be creating 5 pages: a Homepage with bio, historical games or movies (in place of album page) with at least 4, game schedule or list of awards (in place of tour page), merchandise page, and a stats page (in place of top singles page). 9 - Web file is saved as a HTML file and saved in the root folder. The root folder is saved in the Web folder in your portfolio. How do you create an interactive web page using CSS in a wysiwyg program? Create an interactive web site that will utilize all areas of digital media. You have been hired as web designer by Fortune Design Company. They want you to create a basic web site for a business You are to follow the directions given by the project manager for the target audience to complete the project. Once complete then you should review the checklist for grading criteria before turning in your work. Customize using pictures and logos from the business you choose. Remember you must save all files in your folder and do not move them from this folder, that way everything will appear in Dreamweaver for use. I will check this off at your desk. Use the keyboard shortcut of Shift+Command+4 to get a crosshair that you can use to drag a box around each page to capture a screen shot. You will need to get a screenshot of each page and put those final pages in your portfolio folder. If you can not capture the entire page in one shot, then you must take multiple shots and piece together in Photoshop.